Next season is looking very good. Most of the team came back. We are very experienced and we have 30 seniors on the team. LAFM: What was your best game last season, and why? My best game was against Zachary High. I had 4 catches for 150 yards and 2 touchdowns. My football idol is Calvin Johnson because he is a true professional and show hard work and dedication. I started playing when I was 6 years old for Pop Warner. I will work towards being a sports physician. LAFM: Which is your favorite position, why? WR because I am a play maker and that is where the team needs me. 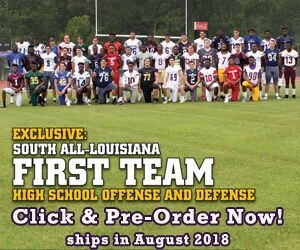 ULL, Louisiana Tech, and Ole Miss. My favorite is Louisiana Tech.